In this podcast, Meghna Bhat and Ashleigh Klein-Jimenez from PreventConnect talk with our partners at Prevention Institute, Lisa Fujie Parks and Alisha Somji, about a new PreventConnect resource prepared by Prevention Institute. 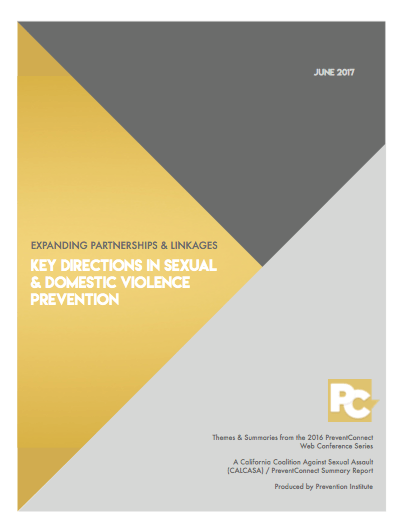 Expanding Partnerships & Linkages: Key Directions in Sexual and Domestic Violence Prevention provides summaries of nine PreventConnect web conferences and highlights key a nd emerging themes from the 2016 series. Click here to download Expanding Partnerships & Linkages: Key Directions in Sexual and Domestic Violence Prevention.